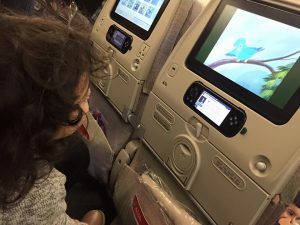 As a family who travels a lot on airplanes, even if mainly to go see the family, we have a bit of experience and there are some things that really annoy us. Well annoy me anyway as the hubby is a pretty chilled out guy. Yes I know we are off on holiday and are going to have a great time but I don’t appreciate having to get up at silly o’clock to get to the airport. Especially with sleepy and grumpy kids. I am not at my best early in the morning. As we usually book in advance we normally pick seats right in the front of the airplane. This is perfect for the quick getaway out of the plane when it lands, shouting ‘Freedom! !’ I hate being cooped up in the plane for 8 hours. But what really raises my blood pressure is waiting for the luggage to arrive. As we are one of the first out of the plane, we usually get to the luggage carousal quite quickly. However, it is pretty much guaranteed we have a long wait for our luggage. We just seem to have such bad luck that our luggage always seems to arrive at the end and I am usually panicking that it has gotten lost by the time it arrives. Yes I am a parent myself and I have no issue with parents taking their children on to the plane; I take two. However, I do see red when you end up with children who kick and punch your seat. Usually these kids are of an age that they should know better and think it’s funny to do so…. and the parents make no attempt to stop them. (Please note I am not including children who have sensory issues etc in this comment). I am not sure if it is just the airlines we use but I have found the staff at check in grumpy more often than not. I am always tempted to tell them to smile. I like having a bit of a chat but when you are faced with an icy cold stare….well then there’s not much point in trying to make conversation. I hate queues. Absolutely detest them. But when you go on holiday you can’t really avoid them. Queues to check in, queues to get on the plane, queues to get luggage, queues for immigration. We recently went to Dubai and the length of the queues at immigration almost made me faint! It’s hard to entertain toddlers in long queues especially when they are tired and grumpy! I have plenty more gripes but I think 5 is enough for today! Do share your holiday gripes with me! CheapHoliayLand.com carried out a survey of 1000 of their users to find out what bugs the Brits when on holiday and they’ve made a fun slideshow. Can you relate to any of them?